Do you ever ask yourself, "what if...?" I certainly do – especially in early December. For instance - what if I didn't get a Christmas tree up at all this year? I mean, it's so much work, driving to the tree lot, picking out a tree that's full but not lopsided, strapping it to the top of the car, and hauling it home. The trunk has to have a fresh cut, the living room furniture has to be rearranged, and the tree must be leveled in the stand so that it doesn't keel over (which is what I'm about to do myself by this point.) Then there's the mess of dried needles in the carpet, not to mention the problem of what to do with the thing after the holidays. What if? What if the ornaments and strands of twinkling lights just stayed in their boxes in the attic? After all, I took great care and time wrapping them and carefully storing them last year. It'd be a shame to undo all of my hard work. And if the ornaments and all those strands of twinkling lights didn't come out this year, there wouldn't be any ornaments or strands of twinkling lights to put away after the holidays. What if? What if I didn't get my usual "oh-so-clever" newsletter done this year? Sure, it's nice to keep in touch with family and friends, but what if I wrote them individual notes during the next few months instead? Besides, I normally include a picture of my kids and grandkids, but with everybody so spread out it's a major undertaking to get us all in the same time zone, much less the same photograph! What if? What if I sent gift cards to my nieces and nephews this year? They're all out of college now, so I'm sure they'd much rather pick something out themselves than receive a gift that doesn't fit, or isn't to their liking. 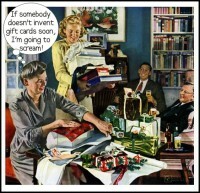 And an added plus is that gift cards can be neatly tucked into envelopes and put in the mailbox at home. No messing with Styrofoam packing popcorn. No wrapping boxes in Christmas wrap and brown grocery sacks. No standing in long lines at the post office! What if? What if I never did any special holiday baking at all? It's just my husband and me at home these days, so who cares if the homemade cut-out sugar cookies never materialize? Besides, as far as I know, there's no law stating that gingerbread men may not appear in January, or that spiced apple cake can't be served on a cold afternoon in February. What if? Now I know that many of you who are reading this have begun to anticipate where I'm heading with it. You're convinced that after spending so much time wondering, "what if I didn't mess with all the bothersome headaches of Christmas?" I'm bound to conclude that it would be a terrible, empty, boring holiday. You're certain that I'll come to my senses and recognize that it is the freshly cut tree and the ornaments and twinkling strands of lights, and the clever newsletter and the special gifts bought with loving care, and the aroma of cinnamon baking in the oven that define the whole Christmas holiday. You know that Im going to end up doing all those things that I dared to wonder, "what if they just didn't get done?" And you're exactly right. But that wasn't always the case. Truth is, one holiday season a few years back, the person in charge of the tree, the ornaments and strands of twinkling lights, the clever newsletter, the gift-buying, and the baking (in other words, yours truly) ended up having major surgery the week before Christmas. It was nothing serious, just "female" stuff, but it involved a three-day stay in the hospital and a recovery of several weeks, nonetheless. And while I could easily have delegated the long list of Christmas tasks to my husband and almost-grown kids, I decided not to do that. Instead, that year my family completely eliminated all the above mentioned holiday hassles, and simply spent a bit of quiet time at home together, listening to carols on the stereo and warming ourselves in front of the fire. And you know what? It was one of the most enjoyable Christmases I've ever spent. So what about you? Is this one of those thankfully rare but decidedly difficult years in which you find yourself contemplating "what if?” and seriously meaning it? If so, and all you need is one person to tell you it's okay to actually follow through on a few (or all) those "what ifs”, then I have just one thing to say to you. Search for Holidays articles similar to "The “What If” Christmas. Search all articles similar to "The “What If” Christmas".